Men, if you have broad shoulders but are slender, and you wear this virtually nonexistent and impossible size called "39R," well, I empathize greatly with you. And ladies, if you are shopping for a man who is "39R," I'm very, very sorry. But I can tell you beleaguered outcasts of the size world exactly where you can find a winter coat. A brief history: George (39R) needs a winter coat. First stop, the impressive Hugo Boss sample sale at Soiffer Haskin. We almost scored a beautiful coat but it was not for 39R's. We then hit Macy's, first checking out the third floor which 39R said was too "old man." Translate: the third floor is full of wool overcoats all fine for the traditional look, but we needed something more modern. So, down to 2 (I cannot get away from Macy's floor 2) where we found the Ben Sherman corner (ask for the very amiable James from Louisiana). Jackpot. They were so perfect George bought not one, but two coats that fit him just right and look great. 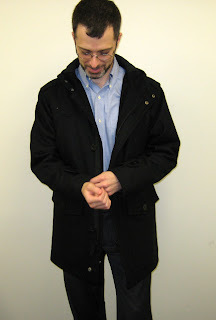 Above is the more casual Sherman that's still wearable to the office. This is a classic for a very reasonable $269. 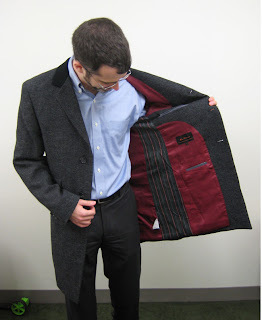 And the money shots: this houndstooth overcoat (right, also $269) is so perfect Ben Sherman! Check out the red lining and the nicely contrasting velvet collar. Also, I love the double pockets. What a coat. Lucky guy, that 39R.